The youth's right is to honour the old. I live in a village that has long woodwork traditions. My grandfather, Aalus Linnamäe, was a wagon making master and I am very grateful to him for drawing my attention to woodwork. 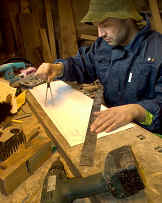 Thanks to him I got acquainted with woodwork tools and made the first wooden toys. I learned consistency and respectful attitude to work. My interest in the kannel started thanks to the instrument's wonderful and mystical sound. For the first time I heard the sound of a little kannel in a theatre performance in 1992. The first try to make a kannel was in 1998, when I used an instrument that was made in Tallinn's Broadcloth's Fabric, as a model. In 1999 I deeply devoted to the making of kannels and the search of a good sound. Before that I used to work as a carpenter for 8 years. With my instruments I strive for a bright sound, handling simplisity, good tuning possibilities and comfort of playing. 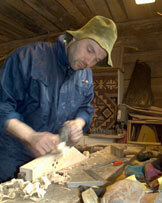 As for the materials I use Estonian precious wood such as oak, birch, maple and ash. The most important part of the instrument - the soundboard is made of special knotless fir wood, that has especially tight grain (resonance material). Special steel wire for musical instruments is used for strings. I ravishingly live through the making of every instrument and I feel great pleasure when it gets ready. I never work on a kannel in a bad mood. When I enjoy the working process, the result gets better. The best instrument gets ready in cooperation with the customer who explains and describes the best his/her wishes. Every instrument is special and unique. I treat kannels with great respect because it has been one of the most important musical instruments in our ancestors' musical self-determination and has lasted through the centuries until nowadays. I am happy that my work is my hobby and I have got a lot of friends in folk club's “Kandlekoda” and among folk musicians. On the 15th of September 2001 I opened a workshop that is specialised on making, restoring and renewing folk music instruments. In addition we collect different types of old kannels for a museum that will be opened soon.